There are some extremely dubious releases coming out this month from 'Keith Lemon The Film' (24 Aug) to 'Cockneys vs Zombies' (31 Aug), by way of 'The Expendables 2' (16 Aug). But we've already caught some good films, and you have the likes of 'Undefeated' and 'The Imposter' to look forward to. 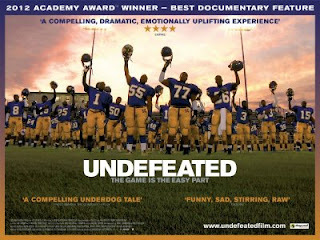 The winner of the 2011 Academy Award for Best Documentary Feature, 'Undefeated' finally gets its UK release this month. Perhaps to tie in with the Olympics. But this sporting documentary, is as much about the human interest as it is about high school American football. Having caught the film at Open City Docs Fest, we can attest to its powerful poignancy. A fascinating strand of US cinema has emerged in the past year or so, reflecting on cults - films like 'Martha Marcy May Marlene' and 'Electrick Children' have offered differing perspectives on this microcosmic outsider societies. 'Sound Of My Voice' appears to carry the ominous undercurrent of the former film, hopefully matching its excellence. We expect so much from Pixar considering their track record. 'Brave' is perhaps not one of their masterpieces but a more than solid effort. An unconventional (fairy)tale of a Scottish princess, with shades of the excellent 'How To Train Your Dragon' and Disney adventures of a bygone era. Sure, we don't need another Bourne film but look at the cast list: Jeremy Renner in the lead role, supported by Edward Norton, Rachel Weisz, David Strathairn and Albert Finney. Adding in 'Michael Clayton' director Tony Gilroy, hopefully this is one line up that will suitably deliver. I hadn't heard of 'Shadow Dancer' until I saw its trailer preceding 'Searching For Sugar Man' recently. It captivated me. Andrea Riseborough stars alongside Clive Owen, as an informant who has to spy on her own IRA family members to avoid a prison sentence and look after her son.